From fava bean frittatas to poached eggs with silky avocado hollandaise, these nine egg breakfasts make great use of spring produce. Fava beans, peas and scallions star in this terrific fritatta, which can be made with whatever spring vegetables are on hand. F&W's Gail Simmons loves these eggs cooked in tomato and bell pepper sauce. This terrific omelet features asparagus, peas and zucchini. Try a lightly honeyed, citrusy white wine with this rich quiche. 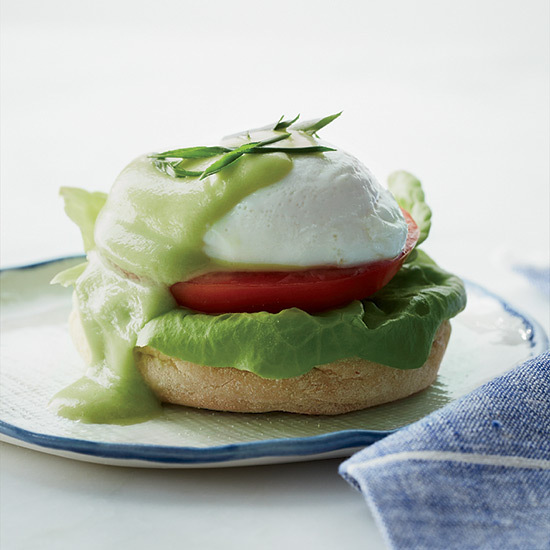 Upgrade poached eggs with creamy, avocado hollandaise. This hearty breakfast sandwich is ready in just 20 minutes. What's the secret to this fluffy omelet? Beat the egg whites until they form soft peaks, then fold them into the yolks. F&W chef-in-residence Hugh Acheson's luscious serves his scallion-studded eggs with kettle-cooked potato chips. Francis Mallman's spring version of a Spanish tortilla requires just five ingredients, plus salt and pepper.